A new council plan aims to create "a city where nobody needs to sleep rough" by 2027. The five-year strategy in Bristol wants to "prevent young people from becoming homeless in the first place". Last year, charity Feed The Homeless described homelessness in Bristol as "an emergency situation". The city council's rough sleeping partner organisation, St Mungo's, had contact with 951 people in 2018 - a 23% increase on the previous year. Another group which helps homeless people in the city, Bristol Outreach Services for the Homeless (BOSH), called the council's plan "ambitious". 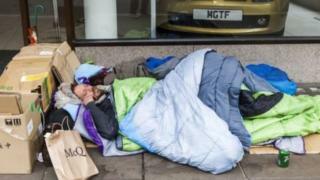 There were an average of 82 people sleeping rough in the city each night last year - the fifth highest number in the UK. Julie Dempster, from BOSH, said: "There would need to be an increase in supported accommodation, and definitely move-on accommodation. "We can't see people with high support needs evicted from accommodation back onto the streets, and the cycle is just repeated. That is not helpful, it's not constructive. "So there need to be some changes made before we can implement this fully." Proposals include increasing the number of "move-on" places - accommodation between hostels and independent living - and focusing on young people and people leaving institutions like prisons and hospitals. Councillor Paul Smith, cabinet member for housing, said: "Rough sleeping is not the only form of homelessness and we are trying to do more to prevent all forms of homelessness through early intervention with those at risk. "One of the main challenges we face in meeting the needs of homeless households is the shortage of affordable housing in Bristol and specifically private rented accommodation affordable to people on housing benefit."